ALS Society of Ontario has been a valued client since 2004. Intrigue has designed and developed countless modules for ALS Ontario throughout the years including news management, user commenting systems, donation software and event fundraising communities. ALS Ontario's most recent site reflects a commitment to community, dedication to creating awareness, and raising much needed funds for equipment purchases. The elements of this site that make it intriguing are the flash animated banners, each telling a unique story and the engaging design that engrosses and directs users throughout their visit. Would you like to see more? 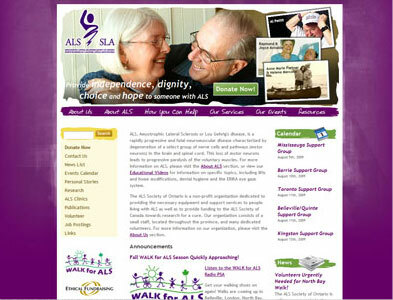 Visit the ALS Society of Ontario's website at: www.alsont.ca. Feeling generous? Why not test out our donation system while you're visiting!